Our hosted private cloud provides the control and governance you are used to with VMware on-premises, along with available capacity to grow as your business expands. Expand your private cloud compute and storage resources by leveraging OpEx vs CapEx as Faction supplies the datacenter space, network connectivity, and datacenter operations. Faction Private Cloud deployments are fully customized and configurable cloud solutions based on a simple building block approach. Our hosted private cloud solution outperforms on-premises workloads and connects to everywhere you need. Now you can expand capacity from on-premises to a VMware-based hosted private cloud, maintain control with vCenter access to your environment, and scale up as you need to increase capacity. Replicate to Faction using existing tools such as VMware Site Recovery Manager to a Faction-hosted private cloud environment. VMware tools help you automate disaster recovery workflows to reduce human errors during a high-pressure disaster situation. 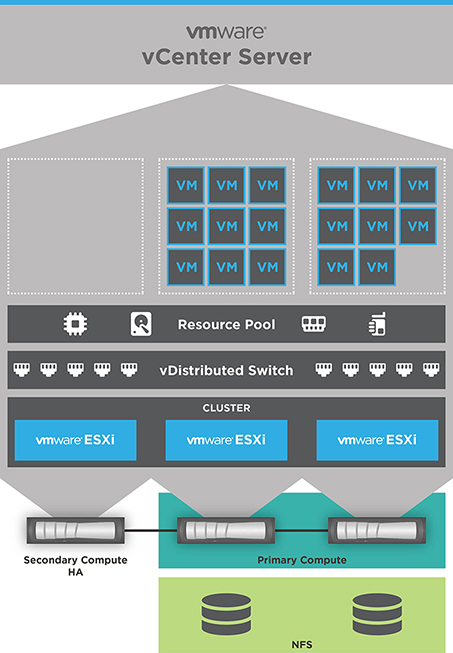 The VMware stack running on Faction private cloud provides a stable and proven platform to run leading virtual desktop infrastructure solutions like VMware Horizon View and Citrix Virtual Apps and Desktops. Leverage our hosted private cloud as an expandable, low-cost storage target for your critical data and applications, and enable replication using familiar VMware technologies. Trying to get out of the datacenter business? Not all applications are ready for public cloud. Migrate to a hosted private cloud on a familiar VMware technology stack to reduce migration risks and application compatibility issues. You don't need to deploy new gear in your datacenter in order to gain the benefits of a private cloud. Exchange CapEx for a monthly bill, saving on upfront costs and reducing ordering and deployment times. Faction does not limit admin access to VMware vCenters hosted in our datacenters. You can maintain control over your environment and leverage existing VMware tools like vRealize Operations Manager for environment insights. Utilize VMware Site Recovery Manager, a proven disaster recovery solution, to replicate on-premises. We provide the managed services you need in case of a disaster event. Public cloud is great for many uses cases, but VMware is proven to run legacy applications better than any other virtualization platform. Leverage our hosted private cloud with familiar tools without the need to hire and retain expensive public cloud talent. Reserve, compute, and storage for disaster recovery and bursting workloads. Add a private, secure, high-performance virtual circuit to AWS, Azure, or Google Compute, and connect to your colocation at CoreSite, Digital Realty, CyrusOne, and more. Read our product overview for Faction's Hosted Private Cloud Solution. Check out our video product overview for Faction's Hosted Private Cloud Solution. Watch the video to learn why MiTek decided to move to the cloud with Faction and our partner, Peak UpTime.